If you’ve started to look on the Internet for the best bowl for wet cat food, it could take you weeks to document the perfect choice. In this article, we’ve put together the reasons why you should choose certain products at the expense of others and some features that the best cat bowl for wet food must have to be a good candidate. If for whatever reason, you do not have the time to read the entire article documented by our team, you should know that weighing these factors and the wet cat food bowl reviews, our recommendation goes to Cat Guru Premium. This product is made from a non-slip material, it prevents whisker fatigue, and it is made from a melamine that is non-toxic for cats. If the best wet cat food bowl is not for sale at the time of your purchase, a safe second choice would be Warm Me Up Pet Food Dish, so you can buy your pet a new cat bowl either way. 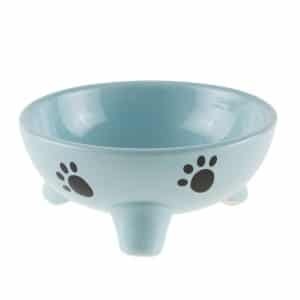 Made from melamine, this cat food bowl is created to avoid spillage and to ensure that the bowl will not slip on the floor even when dealing with a more energetic cat. The ripple design on the inside of the bowl makes this model stand out. There will be no more chasing after the last bits of food, and your cat’s comfort level will increase. The material is non-allergenic and non-toxic, and that’s a plus you should consider. Cleaning the food bowl is a bit of a chore, as wet food will tend to stick to it. 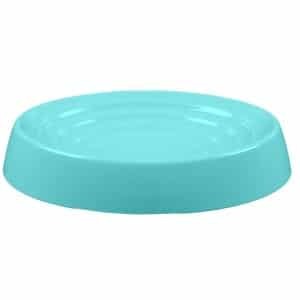 An excellent choice for cat parents who want a bowl that allows their pets to eat everything with ease. One issue many cat parents have with wet food is that it spoils easily if left in a bowl for hours, unlike dry food. This model solves this problem by coming equipped with an airtight lid that allows you to store the wet food away after your cat is done eating. The porcelain bowl can withstand low temperatures, and it is also microwave safe, in case you want to warm up your cat’s food. Moreover, It is dishwasher safe. This item is a bit on the expensive side, which may prevent some cat lovers from getting it. A cool option for cat owners who want to feed their furry friends a wet food diet; dishwasher safe. Whisker fatigue can be quite problematic for cats, and some may even refuse to eat altogether from a bowl because they hate to have their whiskers touch the edges. This model is created with the need of combating this issue in mind. The company making it even made side by side comparisons with other designs, to see which one the cats prefer. This design came up the winner, and it is useful for picky eaters. It doesn’t look like such a great choice for dry food, as cats can spill it easily. A wet food bowl designed to prevent whisker fatigue in cats. Unlike other models, this one’s created by a pet doctor. This product is a great choice if you’re looking for a non-slip product, which prevents food from getting off it and making a mess all over your house. It is made from a special type of melamine that will not be intrusive for your animal. The material is both non-toxic and non-allergenic so that you can forget about unpleasant surprises. The bowl has a shallow form and a ripple design that allow your pet to eat easily, without having to work too hard on getting the food, even when there isn’t more left in the bowl. Due to its innovative design, the bowl prevents whisker fatigue and allows your cat to remain clean during the eating process. The creators of this product are convinced that their bowl is a perfectly good solution for your cat, and should you not think the same, they practice a money-back guarantee. The bowl should be washed after each use, as cats usually smell the remaining food and have a discomfort during the following meal. This bowl is a good option when it comes to feeding your wet cat food, as it comes with a silicone airtight lid that allows users to store the remaining food until the next meal, without having to leave it to sit near the dry food. Wet food can spoil if left unattended for a number of hours, especially in the case of sitting in room temperature conditions, which is not how it should be kept after it was opened. The Warm Me Up Pet Food Dish is an FDA-approved cat bowl, which is designed to be practical both for the human and the pet in the household. The bowl is made from porcelain, and its lid is made of silicone to ensure the airtight storing. The product is dishwasher safe and, due to its small dimension, it can be easily stored in the fridge without taking too much space. Additionally, the bowl is microwave safe, which allows the user to safely warm up the food before reserving it to the pet. This product was tested in the lab for full functionality, in the team’s attempt to create a solution that makes cat’s meals a comfortable time, not just a delicious one. In a side by side test, most of the cats preferred this product over competitors’ solutions because the bowl is specially designed to get over whisker fatigue. This problem is quite often among cats, and the bowl is created to ensure stress-free meals. 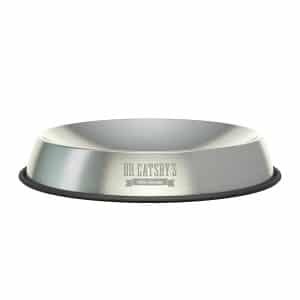 The Dr. Catsby’s Food Bowl is made of stainless steel, which is resistant to bacteria that causes acne among cats, thus being veterinarian-approved. The modern design is created to accommodate one day worth of wet food, in order for pet owners not to overfeed their animal. In addition, the bowl has a modern, minimalist design, due to both its color and model, which allows it to be placed anywhere in the room without drawing too much attention or disrupting the user’s home design. 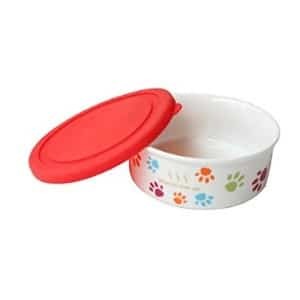 The product is made of high-quality porcelain clay raw materials, which allows it to be used safely in the microwave so that users can warm the food before giving it to their pet. The bowl capacity is 170 grams of water and approximately 85 grams of food, making it a good choice for home meals and storing and feeding water when you are on the go. The bowl is collapsible, which makes it easy to carry around whenever you feel like taking your pet along on holiday. The bowl has a special design that makes it the perfect height for ensuring a good digestion, while the animal does not need to stretch its neck too much. Another aspect of the bowl’s design are the three feet, which provide both physical stability and the suitable height for a healthy position of your pet during meals. Additionally, due to its design, food remains in the center of the bowl, which makes it easier for the pet to eat it without having to chase it around the bowl first. As the name suggests, this product is not a regular bowl, but an entire food station in your home. Its design is pet-friendly because of the height of the bowl, which ensures a healthy position during meals. Thanks to the model, your pet can easily eat the food without being in an uncomfortable position and without having to chase it around. 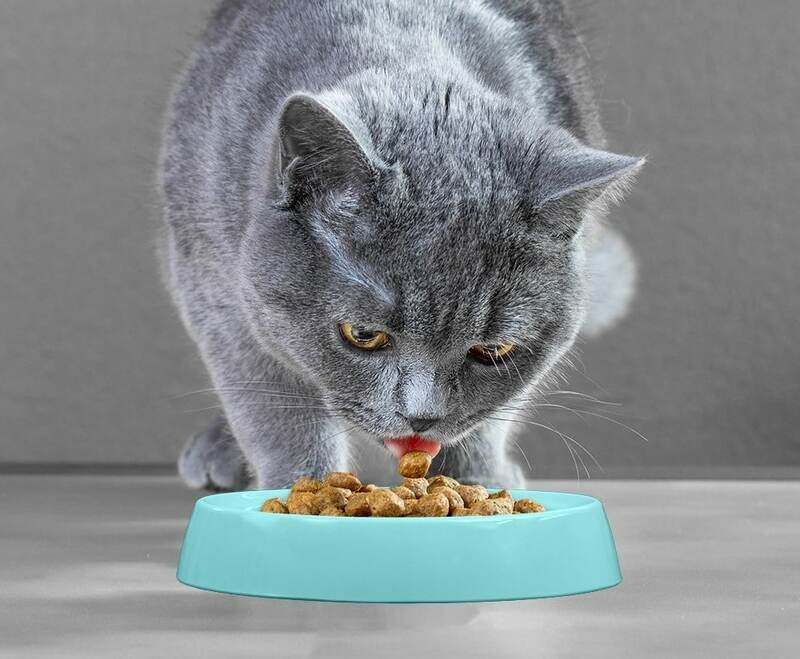 The Cat feeding Station with Spill and Skid Resistant Silicone Base has a convenient design and consists of two different bowls – one for food and one for water. The two bowls come on a special tray, to which they are glued, thus preventing the mess that can sometimes occur at the feeding place. The tray comes with a raised outer lip, which prevents spillage in the room even in the event that water or food gets spilled on the tray. The tray is made of a flexible material, which makes it easy to clean and transport. If you’re a cat owner, you are probably used by now to the fact that your animal will occasionally spill food and water outside of its eating and drinking bowls. In order to prevent this kind of happening, you may want to look for a bowl design that is friendly both to you and your pet. In this respect, you could be interested in bowls that have a raised outer lip or are made of a non-slip material, which will keep the wet food inside without allowing it to leak everywhere and make a mess. However, a good design for you isn’t always a good design for your pet. Furthermore, you should be looking for a bowl that allows your animal to eat its meal from a bowl that, due to its design, will keep the food as close to the center of the bowl as possible. A good design is not the only factor that matters when looking for a good bowl of your pet. Recent research shows that the better part of the health issues that cats have during their old age are caused by a poor position while eating and drinking water. Because of this, you want to make sure that the height of the bowl is good enough for your animal to maintain a correct posture, which also ensures digestion and prevents it from developing joint problems. If you don’t find a product with adjustable feet, you should consider getting a support to place it on. Not all products are equally user-friendly when it comes to their functionalities. When buying this kind of bowl, you may want to make sure that you can use it in the dishwasher so that you don’t have to clean it manually every time. Additionally, you may want a product that can be safely placed in the microwave. It goes without saying that in terms of usability, a product that has a lid and can be put in the fridge to conserve the food is a game-changer. You don’t have to buy a bowl that does all of this, however. Because each family has its way of working, you have to focus on factors that benefit your situation. If for instance, you only feed your cat half a portion of wet food in the morning and the other half in the evening and you keep the remaining food in the fridge in its original container, a bowl that can be placed in the microwave may not help you so much, but you would still want to consider the option of automatic dishwashing. While cats are not the kinds of pets we take away with us all the time, getting a product that is travel-friendly can help a lot when you have to go somewhere because you don’t have to buy extra products that will take even more space in your home. Being ergonomic is your friend, and you should focus on finding collapsible bowls, for instance, which are easy to carry around.